Martin Hopkinson opened a discussion to try to identify the artist of ‘Classical Harbour Scene’ in the collection of Barrow-in-Furness Borough Council. An initial clue was an inscription lower right, positioned on the stone nearest the water, which appeared to read ‘JUSTUS RUZLYNA / ROMA’. Andrew Greg (Art Detective Group Leader for British 19th C, except portraits) tracked down a strong candidate in Justo Ruiz Luna (1865–1926), a Spanish artist from Cadiz, of the right period with a maritime specialism. 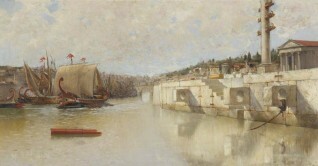 He also suggested that Ruiz Luna presumably classicised his name for the Roman harbour scene. A biography on the Prado website revealed that in 1888 he sent, from Rome, a historical subject, Ostia, to the International Exhibition at Munich. Andrew wondered if this could be the Barrow-in-Furness work. Investigating further, Victor Rafael Veronesi discovered The Old Harbour of Ostia in a catalogue of the show. Kieran Owens meanwhile drew attention to a Ruiz Luna work, Reconstrucción del antiguo puerto de Roma, mentioned in a Madrid exhibition review in the Spanish newspaper La Iberia, in 1892. The year placed it in the right timeframe for the gift to Captain George Walker from the Spanish government in 1895. Significantly, Kieran found a catalogue for the exhibition. The dimensions of the relevant work were given as 43 x 83 cm, which corresponded quite closely to the 40 x 79.5 cm recorded on Art UK for the Barrow-in-Furness painting. Kieran explained that the difference could be accounted for by the overlap of the frame. Osmund Bullock added that the collection’s website shows the frame, splendidly adorned with the royal arms of Britain and Spain. Backing up the Prado’s artist dates, he also sourced a copy of Ruiz Luna’s birth certificate, confirming he was born in 1865 in Cadiz. Pieter van der Merwe (Art Detective Group Leader for Maritime Subjects) pointed out that the dimensions were very close to those of no. 1115, the ‘… ancient port of Rome’ exhibited at Madrid in 1892, which was probably also no. 2001 shown at Munich in 1888 as The Old Harbour at Ostia. Pieter suggested checking the measurements to help confirm this. Osmund confirmed the artist’s birth date and Andrew provided a fascinating link to archaeological remains of Roman stone mooring rings. Pieter translated the inscription on the frame, which records that the painting was a gift of gratitude by the Transatlantic Company of Barcelona to Captain G. Walker of the English steamship Ardandhu for towing a disabled Spanish mail steamer. He proposed closing the discussion subject to confirmation of the exact canvas dimensions. Andrea Kollmann then highlighted a lost painting of Ruiz Luna’s called Ostiae, last seen at a Berlin auction in 1934. Although larger than the Barrow-in-Furness work, Pieter thought it likely to be a variant, possibly shown in Munich in 1888, and perhaps the ‘prime version’ of the painting under discussion. Upon request the collection supplied measurements for the stretcher, which at 43 x 82 cm, indicated that it was highly likely to be Reconstrucción del antiguo puerto de Roma, exhibited at Madrid in 1892. With this additional information Andrew Greg concluded the discussion, recommending that the painting be identified as Reconstruction of the Ancient Port of Rome by Justo Ruiz Luna (1865–1926). Who painted this classical harbour scene?